ICYMI, (that means in case you missed it, Mom) it was #NationalSiblingDay yesterday. I am the oldest of four and I absolutely love being a big sister. I have always taken the role seriously, for example, calling mandatory "Family Meetings" to discuss important issues that every eight-year-old has. 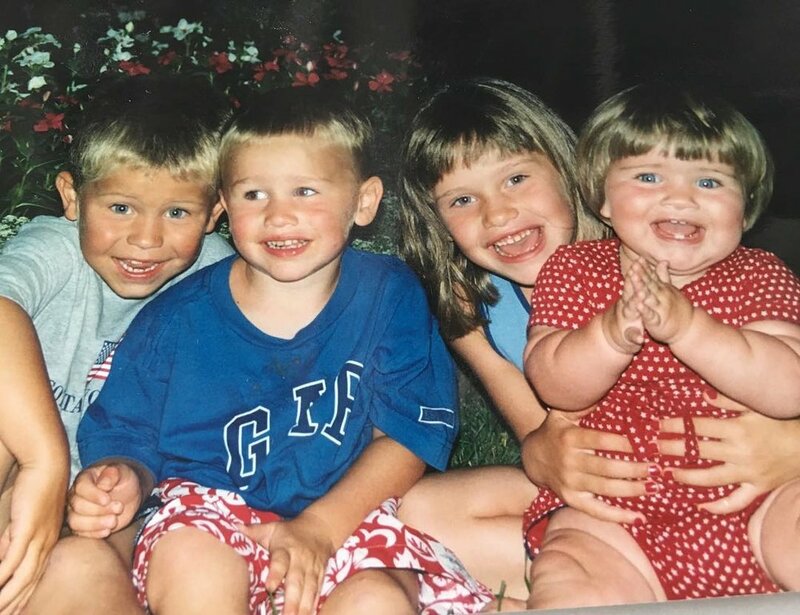 I'd like to think that these meetings (and my bossiness) shaped my siblings into who they are today—because if I can take ANY credit for the wonderful humans that they are, I will. My siblings are powerful beings and there are no bounds to their creativity. We all have our own unique journeys and they have taught me so much. Jack is extremely smart and knows all things sports more than, TBH, anyone. My Mom always says, he was pronouncing Russian hockey player names before he could read and it's true. I grew up watching Jack play hockey, which I'm so grateful for. Now I get to watch that same dedication and passion as he pursues new exciting opportunities—like starting his own company, Winsome and other exciting things I can't talk about yet, but let's just you say you'll see him on screen in the fall doing what he does best. A memory I will never forget: When we were young singing at the top of our lungs, "Let's Be Friends" in the back of the suburban on our way to Florida. Also, sneaking into each other's rooms at night to read, Captain Under Pants. Miles is an actor, writer, comedian and film maker. You can check him out in theaters(!!) currently in the movie "Wilson" and in the fall, "Kickboxer Retaliation." He is the essence of cool and I get a majority of my style inspo from him (and Jack.) He sees the world simply, is extremely caring and I know he always has my back. Ruby is QUEEN. She's fearless and her Instagram name is Rubyonce. Need I say more? I don't, but I will. Watching Ruby navigate the dark depths of high school has been nothing short of inspirational. She carries herself with a confidence and maturity that sometimes surprises me. She is the funniest person I know and is constantly making me laugh. She has her own vlog (check it out immediately,) she writes comedy sketches and kills it at improv. We plan on working together in the future. Thank you Mom and Dad, for giving me three incredible siblings who challenge me to show up and be the best I can be everyday.